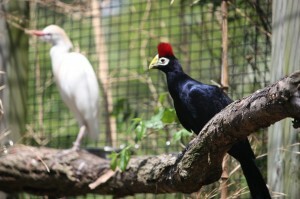 The Lady Ross’s Turaco (rhymes with Morocco) has a crest of red feathers on the top of its head. It has beautiful feathers with a copper-based pigment that makes this bird really shimmy. This is a tree dwelling fruit eater that lives in family groups. The bird will dive into water if threatened. They have a heavy, labored flight. The mostly like to hop from branch to branch. Up to eight birds will live together and defend their territory.